I was a little dubious about this beer when they launched it a couple of years ago. As a wine drinker myself, I was the target market on all levels - price, aesthetics, product placement and production method. This is a beer brewed with Champagne yeast from the Alsace region in France. Personally, my expectations were high and I was seriously disappointed as a result. I found this kinda boring... Crisp and dry with some floral notes and way too carbonated. I felt it didn't warrant €2.99. Molston Coors own the brand and have recently set up shop here in Ireland. The product has fallen hugely in price thus making it affordable and have also released Kasteel Cru Rose. I opened this last night and was really impressed with the quality and style. This is like a Cremant or Sparkling wine from France. Dry, Biscuity palate with some subtle summer fruits - tinned Strawberries. Crisp, clean citrus finish. Really elegant and a great aperitif or just good for lowering (responsibly!!). Novel, interesting but not gimmicky. A really good beer and available in Deveney's now for €2.29 bottle. I reckon and I'll be slated for saying this but it's a great alternative to Prosecco for a fraction of the price. A different style but variety and all that!! 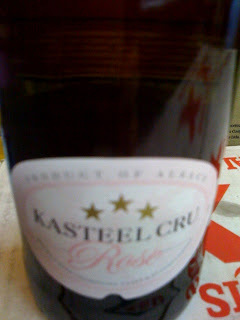 Kasteel Cru Rose and White €2.29 Bottle. Ruth, Tried this a couple of years ago while holidaying in France. It's really good. Delighted I can get it in Dublin. Could you order me a case? Thanks, Siobhan. No Worries Siobhan, Give me a ring in the shop on 012984288. I'll organise a case for you.